When I visited Stephanie Siân Smith at her workshop in the roof of an old warehouse in Bethnal Green, she was working flat-out through the weekend to make a collection of ten different headdresses for an order to be delivered this week. Everywhere I looked there were feathers of diverse kinds, embroidery, lace, cloth and all manner of paraphernalia which Stephanie uses to contrive her extravagant headdresses, that have made such a hit in the capricious world of fashion this year. Meanwhile, her ginger cat, Marmalade Donkey Ron Jeremy Clarkson (given a different name by everyone at the house in Gun St, Spitalfields where Stephanie lives), strolled around among the feathers and debris, intrigued by the spectacle. Stephanie comes from the tiny village of Hanbury in Staffordshire where her grandmother taught her how to sew. “It’s a lot do with the fact that I grew up in the middle of nowhere,” she revealed, outlining a rural childhood where she devised her own entertainments, and explaining something of her playful creativity that bridges handicrafts and high fashion with such bravura and charm. When Stephanie talks about her family, her father who is a steel fabricator, or her aunt that took her skunking in Alberta, you get a strong sense of Northern personalities, people who know who they are. And Stephanie herself is no exception, because while she enjoys spontaneous delight in what she does, a quality that is communicated by the fanciful drama of the headdresses, she is also taken seriously by Mrs Jones, an acknowledged arbiter of taste, who styles Kylie Minogue and The Scissor Sisters. There is a feeling of liberation when you don a headdress, a licence for flamboyant, cheeky or mischievous behaviour. 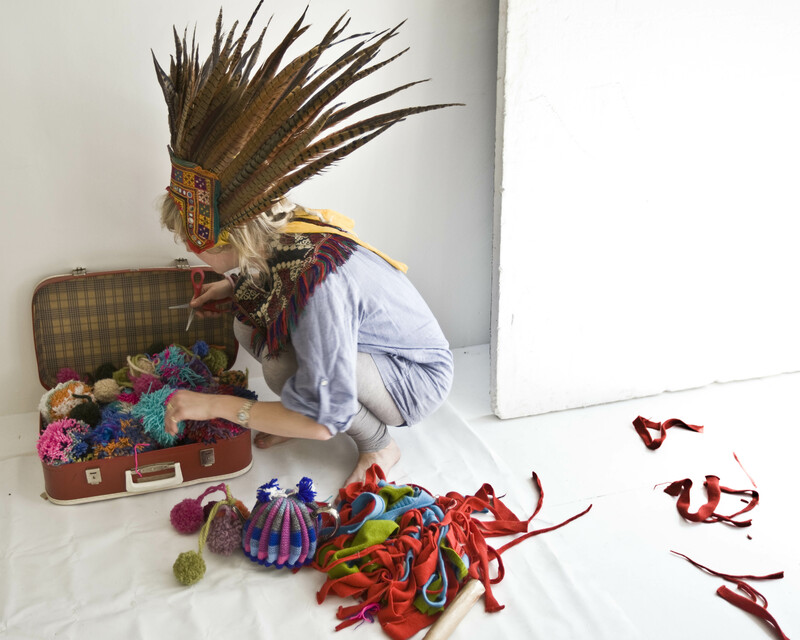 Irrespective of your clothing, the headdress is sufficient to set you apart from the world as participant in a surreal drama – the child within the adult is released. “People like to wear them at festivals,” explained Stephanie, and I can imagine that possessing one could be an invaluable confidence booster at a parties, especially if you were feeling a little shy. With her doll-like features, huge blue eyes and unkempt blonde hair, Stephanie is the ideal model for her headdresses and, several times during our conversation, when she tried one on to the gauge the effect, batting her long eyelashes flirtatiously and asking “What do think?”, I was stuck for a response. She looked like someone had taken her photo and scribbled all over the top of it with coloured crayons. 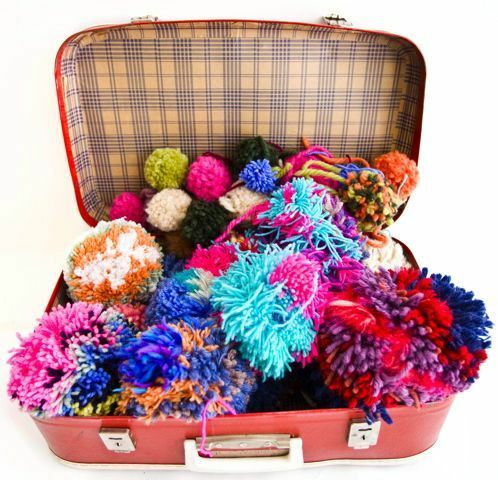 “Would you like to see my pom-poms?” offered Stephanie – a twinkle in her eye – throwing open a suitcase with a theatrical flourish to reveal dozens of those multicoloured woollen pom-poms that every child makes by winding two rings of cardboard with whatever spare yarn is knocking around the house. 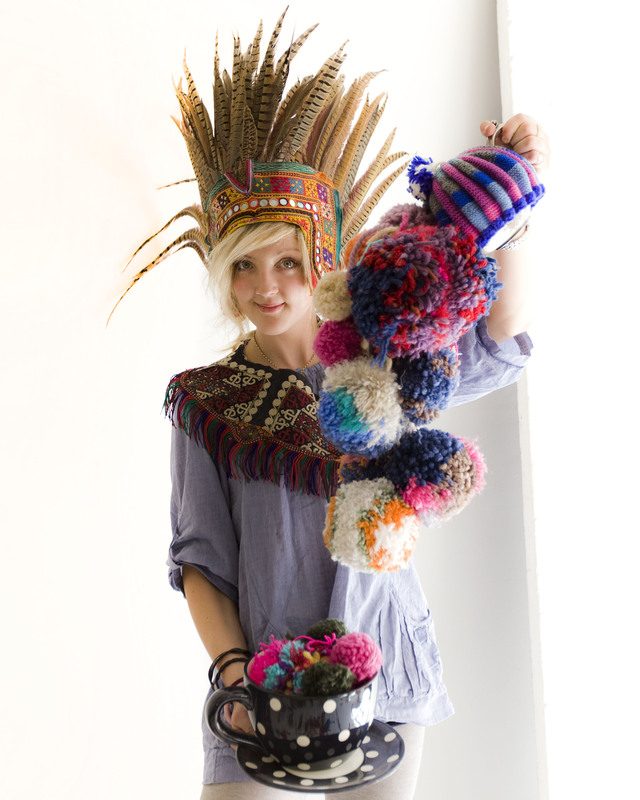 Jeremy Freedman, Spitalfields Life contributing photographer, accompanied me on this interview and, when the case opened, neither of us could withhold our delight at these super pom-poms which Stephanie made in a whole variety of sizes and gauges of yarn. It was time to take pictures and when Stephanie, who is herself an experienced photographer, suggested Jeremy photograph her pouring pom-poms from her teapot with a woolly cosy into a giant teacup, it would have been disingenuous not to acquiesce. Jeremy and Stephanie did a dance in the sunlight, photographer and model, prancing in tandem, as they moved around the studio together in a glamorous scene reminiscent of playful sixties movies. There was an intoxicating sense of infinite possibility in the fleeting moment, an effervescence generated by the exhilaration of youth, the seduction of romance and the escapism of fantasy. Once the impromptu dance was over, the time arrived to leave Stephanie and Marmalade Donkey Ron Jeremy Clarkson to complete the other seven headdresses in time for the opening of Mrs Jones’ shop. You have to admire Stephanie’s wit and confidence, “I am just doing it for myself, I like working with feathers,” she says plainly, before listing the gamekeepers of Suffolk, Staffordshire and even Balmoral, that she has befriended to keep her supplied with the materials of her trade, which are a byproduct of the making of game pies. Engaging with the emotional vocabulary of childhood dressing up games, Stephanie has refashioned these images, introducing rare humour into high fashion and having a lot of fun too. As we shut the door on this colourful and bizarre world, I wondered if this could be the start of major trend for the cognoscenti to sport headdresses in daily life. Walking along Bethnal Green Rd in the noise and dust, I wondered if I should ask Stephanie to make me one to give me confidence when I visit the supermarket in Whitechapel. Hats off to the ingenious Miss Smith, making whimsical headdresses for Mrs Jones! 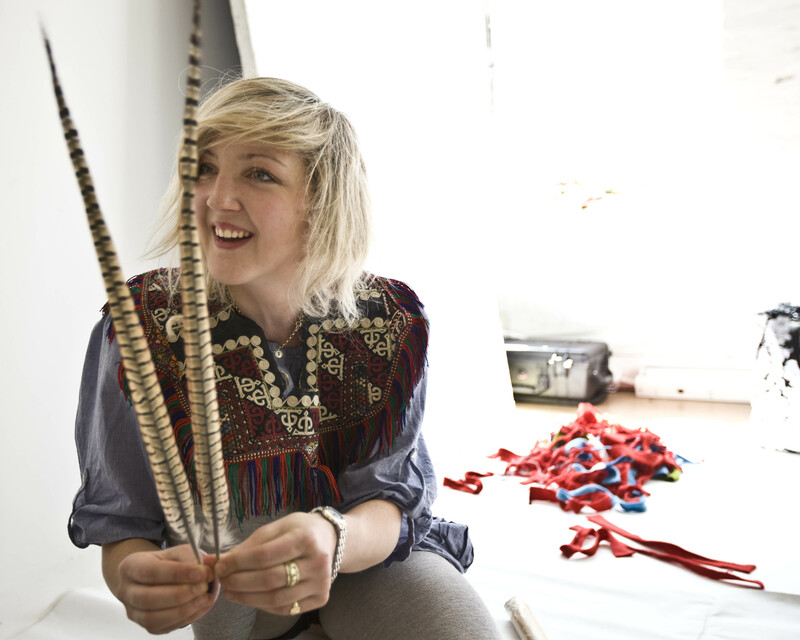 If you want to get one before everyone else does, you can visit Mrs Jones, and see more headdresses by looking at Stephanie Siân Smith’s blog feathersmith.